FAQs > Push Notifications FAQ > How do I manage iOS push certificates for push notifications? To enable an app to send push notifications to iOS devices (iPhone, iPad and iPod), you require a push certificate. A push certificate authorizes an app to receive push notifications and authorizes a service to send push notifications to an app. You link the push certificate to the app when you publish the app for distribution. For communication with iOS devices, push messages are sent via the Apple Push Notification Service (APNS). In order to send a push notification to a user, Swrve must provide Apple with a push certificate that authorizes Swrve to send push notifications to your users on your behalf. If your app is not enabled for push notifications, create a push certificate. Export the push certificate to a file. Upload the push certificate to Swrve. Once Swrve has a copy of your push certificate, Swrve can send messages to your users on your behalf. For more information about managing push notifications in Swrve, see Intro to push notifications. To follow the instructions below you must have already registered your iOS app with Apple through the Member Center. Step 1: On the Apple Developer site (https://developer.apple.com/), log on to the Member Center. Step 2: Select Certificates, Identifiers & Profiles. Step 3: Select Identifiers in the left-hand navigation, then select App IDs. Step 4: In the app list, select your app. Step 6: If push notifications are disabled, select Edit and enable push notifications. Provision your app with the production certificate. Archive your development app for ad-hoc distribution. Load the app onto your device. Connect the device to Xcode. Continue to develop and test. If you decide to use the Development SSL Certificate (for example, to test your push notifications), ensure that you update the certificate with the production version when you launch your app. Open Keychain Access (in the Applications > Utilities sub-folder). Navigate to Keychain Access > Certificate Assistant > Request a Certificate From a Certificate Authority. Populate the certificate information with your email address. Use your own name for the Common Name. Leave CA Email Address blank and ensure that Saved to disk is selected. Select Continue, enter a filename and a destination, and then select Save. This saves the file to the requested location, with an extension .certSigningRequest. Step 9: Return to the Apple Member Center and select Continue. Step 10: Select Choose File to upload the .certSigningRequest file. Step 11: Select Generate to generate your push certificate. A screen is displayed stating that your push certificate is ready. Step 13: In your Downloads folder, locate and double-click the aps_development.cer file. Step 14: Return to your Keychain Access and navigate to the Certificates category of the login keychain to locate the push certificate for your app. Step 1: Open Keychain Access (in the Applications > Utilities sub-folder). Step 2: Navigate to your push certificate in the Certificates category of the login keychain. Step 3: Right-click the certificate and select Export from the context menu. Step 4: Enter an appropriate name for the file, leaving Tags empty and leaving the file format as .p12, and then select Save. You are prompted to encrypt the certificate with a password. Step 5: Either encrypt the certificate with a password (recommended) or leave it blank. Step 6: Select OK to export the certificate. Generally, you upload your push certificate in Swrve when configuring the Integration Settings screen as part of the Swrve onboarding process. iOS push certificates are valid for 12 months and should be replaced annually to avoid interruptions to your push service. You can edit the settings on this screen later on if required. Step 1: On the Settings menu, select Integration settings. 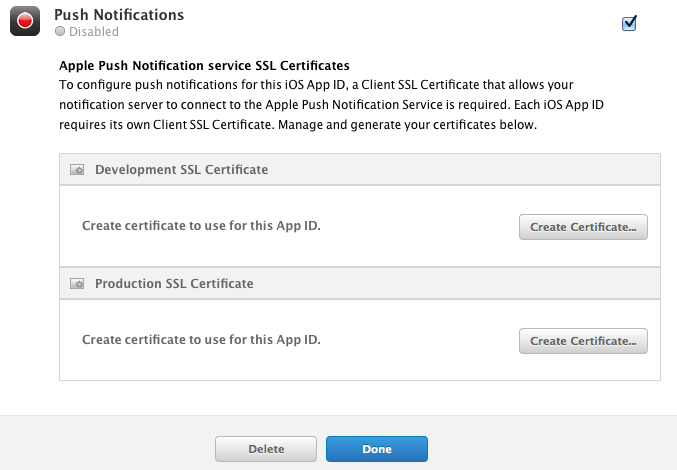 The Apple push notification settings are displayed under Push Notifications, in the Apple APNS Certificate section. Step 2: Select upload new certificate to display the push certificate settings. Step 3: Select Choose File and then navigate to your saved development or production push certificate and select it. Step 4: If you encrypted the push certificate when you saved it, enter the password in the Password field. Step 5: Select Upload. After you receive a green success notification, the push certificate is displayed in the Apple APNS Certificate section. Select your device from the Select QA device list. Date Error – APNS certificates are valid for one year from the date they are created and must be changed annually. This notification indicates that the certificate you are trying to upload to upload has an invalid date stamp, where today’s date is not within the certificate’s date range. You may need to create a new certificate. Certificate or Password Error – This message indicates that Swrve could not parse the certificate file. This may be because the certificate is not encoded in the expected p12 format, or because the password provided was incorrect. Please retry your upload, paying particular attention to the password you use. APNS Certificate Refused Error – This message indicates that the certificate was properly interpreted but was not accepted by Apple’s APNS push system. This could happen for a number of reasons and you should consult Apple’s documentation for more information. iOS push certificates are valid 12 months from the day they are created. When the certificate is due to expire, Swrve attempts to notify you through dashboard notifications and emails. If you encounter these messages, it is important that you act quickly to replace your push certificates as all iOS push notifications, including your scheduled and recurring push notifications, stop functioning once the certificate expires. You can easily create a new certificate by repeating the steps outlined above.